The Philippines is found just off of the south-eastern coast of Asia. It is bordered by water on the east by the Pacific Ocean, on the south by the Celebes Sea, and on the west and north by the South China Sea. Out of 7,107 islands and islets, only about 1000 of these islands are inhabited. The populated and mountainous islands are grouped into three: Luzon, the biggest island group, covers 141,395 square kilometers; Visayas, 56,606 square kilometers; and Mindanao, 102,000 square kilometers. Other main islands are Samar, Negros, Palawan, Panay, Mindoro, Leyte, Cebu, Bohol and Masbate. The Philipine archipelago is divided into 15 regions. 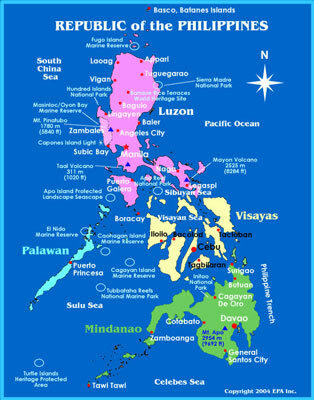 These regions are divided into provinces, and the provinces into cities and municipalities, and these into barangays. The Barangay is the smallest political unit in the Philippines. The total land area is slightly more than 300,000 square kilometers. Only approximately 1,000 of its islands are populated, and fewer than one-half of these are larger than 2.5 square kilometers. Eleven islands make up 95 percent of the Philippine landmass, and two of these — Luzon and Mindanao — measure 105,000 and 95,000 square kilometers, respectively. They, together with the cluster of the Visayan Islands that separate them, represent the three principal regions of Philippine geography that are identified by the three stars on the Philippine flag. Topographically, the Philippines is broken up by the sea, which gives it one of the longest coastlines of any nation in the world. Most Filipinos live on or near the coast, where they can easily supplement their diet from approximately 2,000 species of fish. Philippine geography is part of the western Pacific arc system that is characterized by active volcanoes. Among the most notable peaks in the Philippines are Mount Mayon near Legazpi City, Taal Volcano south of Manila, and Mount Apo on Mindanao. All of the Philippine islands are prone to earthquakes. Philippine geography includes the northern Luzon highlands, or Cordillera Central, rise to between 2,500 and 2,750 meters, and, together with the Sierra Madre in the northeastern portion of Luzon and the mountains of Mindanao, boast rain forests that provide refuge for numerous upland tribal groups. The rain forests also offer prime habitat for more than 500 species of birds, including the Philippine eagle (or monkey-eating eagle), some 800 species of orchids, and some 8,500 species of flowering plants. The country's most extensive river systems are the Pulangi River, which flows into the Mindanao River (Rio Grande de Mindanao); the Agusan, in Mindanao which flows north into the Mindanao Sea; the Cagayan in northern Luzon; and the Pampanga, which flows south from east Central Luzon into Manila Bay. Laguna de Bay, east of Manila Bay, is the largest freshwater lake in the Philippines. Several rivers have been harnessed for hydroelectric power. The Philippines has some of the finest seaports in Southeast Asia. Manila Bay has an area of 1,970 square kilometers and a coastline of 192 kilometers. The Philippines has an estimated coastline of 18,411 kilometers. The islands of the Philippines have beautiful coral reefs which attract tourists from all over the world. To protect the country's biological resources, the government has taken a first step of preparing a Biodiversity Action Plan to address the conservation of threatened species.